tags: Earth is a memory worth fighting for. Sixty dark years after the victorious but utterly devastating war against an unforeseen alien invasion which left humanity practically on the verge of extinction, most of the remaining earthlings have long since they relocated on Titan, Saturn's largest moon, in 2077. Left behind in the uninhabitable and barren Earth along with a handful of survivors and the extraterrestrial invaders, is the drone technician, Jack Harper, and the communications teammate, Victoria Olsen, who monitor the planet before mankind's final migration to Titan. However, when the plagued with unexplained visions, Jack, rescues the cryptic woman in his dreams, flashbacks of a fragmented memory will soon unearth a startling secret about his mission. In the end, what is the real threat, and above all, who cloaks the truth? In 2077, the human Jack Harper works with his companion Victoria "Vica" on the surveillance station Tech 49. Jack repairs drones and his memory was erased as part of the security process to stay on Earth, and he knows that Earth is completely depleted after sixty years of war against the alien invaders Scavengers "Scavs". The aliens have destroyed the moon and were defeated by nuclear weapons and the earthlings have moved to Saturn's moon Titan since the planet was completely destroyed. Now Jack has to protect the power stations that use the ocean to supply energy to Titan fixing the drones. He also has recollections of a mysterious woman at the Empire State Building when Earth was habitable. Jack and Vic receive instructions from Sally (Melissa Leo), who is located on the space station Tet, and Vic is anxious to leave Earth in two weeks to join the survivors on Titan. 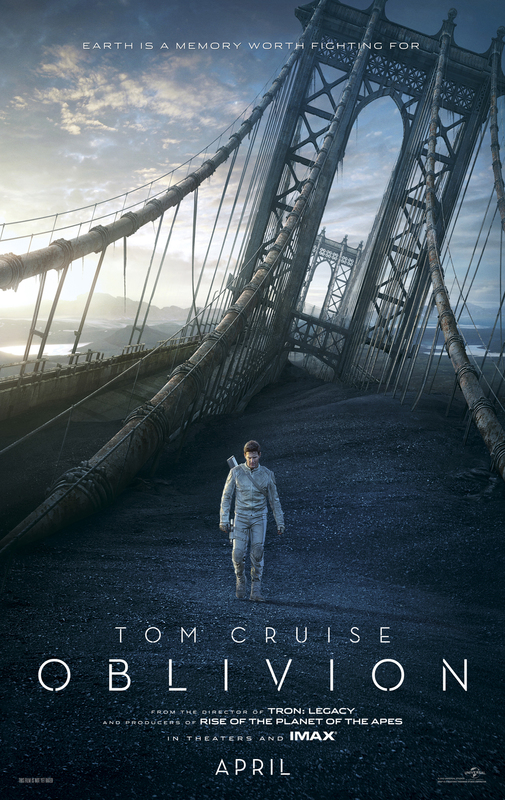 Oblivion, starring Tom Cruise, Olga Kuriyenko and Morgan Freeman. Directed by Joseph Kosinski, director of the efficient Tron in 2010. Recently a lover of sci-fi movies, I got to admit that this one has a lot to offer. Visually, the movie is amazing. I personally loved the pursuit with the drone and the ship that Jack is driving in the middle. The idea stays original and it brings us to think about something, to just take a look on what the earth is gonna look like in the future, which is good, (okay, maybe the year 2017 is too soon for the planet to get look like in the film). Personally, for someone who likes to appreciate good actor performances in the movie, I think that this film was not the worst that Tom Cruise played in in his career, in terms of acting. Still Tom Cruise played in pretty not bad sci-fi movies like Minority report (god I HAVE to see it again! ), Morgan Freeman is, as always, an actor of good talent. Honestly since I just saw the whole Batman trilogy I just like to see movies with this actor. But Kuriyenko's acting is just bad I think. But damn she's hot. And maybe the love story was a bit too much? Anyway I also saw some good references to other sci-fi movies like 2001: a space odyssey, which is one of my number one movies of all time. Oblivion can be a bit boring at the start but the climax for me was almost breathtaking and quite very interesting. Sci-fi lovers are definitely gonna love it and I recommend people to see it because it's very entertaining and worth every penny. So there's my review and I hope you're gonna like it. Sometimes, it is impossible to separate the story from the storyteller. When that happens, suspension of disbelief is easy, and the art becomes a part of life. This is rare. Often the great story is told and the teller succeeds by bringing it to the fore and staying out of the way. A movie is a great story teller, but often the medium eclipses the message. This is clearly one that does. The polish of the production almost blinded me from the view of the movie. Great FX, immense star power, and an excellent score left whatever was the point of the movie on the cutting floor. An escape? Yes. However, as the plot developed, the lack of character pathos and reliance on amazing vistas let my mind wander. Any time the story gives you time to think, it is usually a bad thing. Tom Cruise was excellent, as usual. The rest of the cast, including Morgan Freeman, complemented the star well. But the story never dared to go anywhere you might not have guessed, and the ending was predictable in a way that did not make me feel perceptive. Well, there's a little clue when Jack goes to the stadium, the drone 166 has been shot down and the fuel cell has been taken and its been damaged. Vika says to Jack, "The whole central core is off alignment, you don't have the necessary tools down there." And Jack uses a piece of chewing gum to glue a piece back in place so that it works. That is an example of something that only a human can do. That level of ingenuity, that level of improvisation is something that we are very good at. The Tet realizes that we are very useful at thinking on our feet and on the fly. That's why humans make great drone repairman. What the Tet didn't realize is that same level of ingenuity and what it is that makes us special ultimately leads to us getting the idea that maybe there's a way to take down the system.